The media constantly touts dirty coal, but ignores the amazing progress that the United States has made in achieving clean air. Compared to many parts of the world, including Europe, the United States has excellent air quality. There was a time when air quality in the United States was terrible. Anyone who visited Pittsburg in the 1940s and ‘50s could attest to impossible living conditions due to bad air quality. The Denora, Pennsylvania, disaster brought these conditions to the forefront. 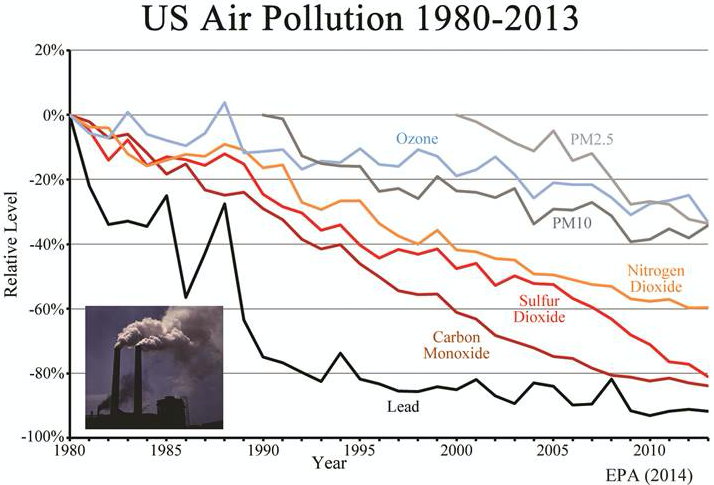 This graph shows the amazing progress that has been made in air quality in the United States. And this map, from Berkeley Earth, compares the United States with many other countries in the world. It’s a view for the month of March, 2017. Note that air quality in Europe, during March, was not as good as in the United States. Note also the very bad air quality in China, which has been widely reported by the media. Achieving air quality improvements in the United State has been very expensive, but the results have been, for the most part, worth the cost. The question now is whether additional improvements can be made at a reasonable cost. The result? While improvements are possible, the air quality component being measured will never reach zero, no matter how much money is spent on making the improvements. That’s why the science used for evaluating benefits is so important. And that’s why the science should be made public, so everyone can see it. An excellent example of why it’s important for everyone to have access to scientific data is the issue of PM 2.5 particulates, and the extent to which they cause health problems. Independent scientists were denied access to the reports the EPA used when calculating the effects of particular matter. At issue is whether particulate size has a bearing on risk. See, Ozone and 2.5 Particulates May Not Be Not Killing People. Why are the number of asthma cases increasing, while air quality has been dramatically improved? 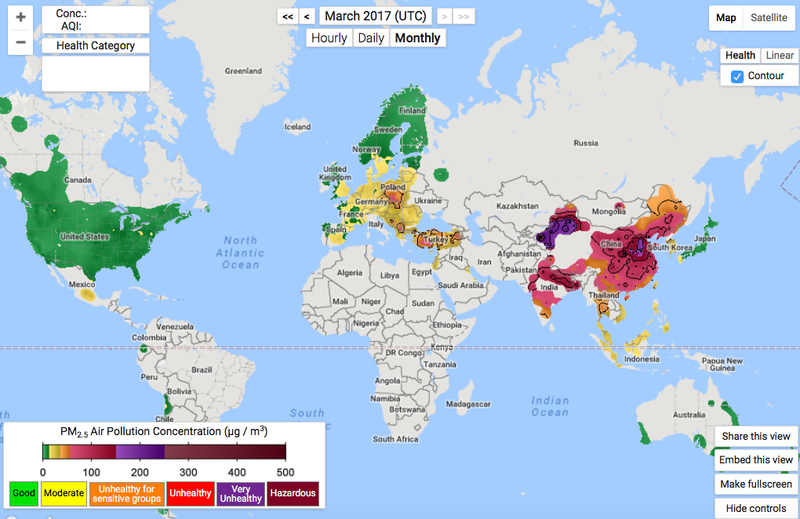 It’s clear from the Berkeley Earth map that the United States has achieved an outstanding level of air quality when compared with the rest of the world. Germany, while spending billions of dollars on wind and solar, i.e, so-called clean energy, has air quality, based on the AQI, that tends to be poorer than in the United States. Each element of air quality should be honestly evaluated using science that’s available to everyone. That is the only way we, as citizens, can be sure that the money being spent on air quality improvements is being spent wisely. Donn, for the summer issue of the column, I would like you to give me your new website information. As soon as it’s available I’ll send it to you.